The formal published beginning of the study of flowing waters (lotic ecology) dates to the early twentieth century in Europe, where initial work focused on the distribution, abundance, and taxonomic composition of lotic organisms. In North America, the ecological stream studies began shortly after. In the 1930s, North American stream ecology was dominated by fishery biology. Stream and River studies worldwide remained descriptive through the 1950s and this period also marked the beginning of a focus by lotic ecologists on human impacts. Descriptive studies detailed the taxonomic composition and density of the benthic invertebrate fauna found in reaches of streams and rivers variously affected by human impacts. Beginning in the 1960s and 1970s there was a shift to more holistic views of flowing-water ecosystems, with research concentrated on a synthetic view of lotic ecosystems, on energy flow, and on organic matter budgets for first-order catchments. In 1970, Noel Hynes, father of modern stream ecology, published his landmark book The Ecology of Running Waters which summarized concepts and literature to that point. With the 1980s, came the realization that running-water dynamics could be fully understood only through an integrated spatial and temporal perspective, and that whole catchments were the basic units of stream/river ecology. For example, holistic organic budget analyses of running-water ecosystems cannot be constructed unless both spatial and temporal scales are applied. The hallmark of lotic research during the 1980s and 1990s was its interdisciplinary nature. Interactions involved stream ecologists, fishery biologists, aquatic entomologists, algologists, hydrologists, geomorpholo-gists, microbiologists, and terrestrial plant ecologists. It was these interactions between the disciplines that focused the attention of stream biologists on physical processes and greater spatial and temporal scales. This perspective of stream ecosystems continues to direct the science in the twenty-first century, aided immensely by the incorporation of geographic information systems (GIS) analysis. Although there is general acceptance that the logical basic unit for the study of streams and rivers is the watershed or catchment, most measurements of lotic ecosystem structure and function are still made at the reach or microscale level. Recently, there has been strong impetus to extend the scope of understanding to the watershed mesoscale and beyond because ecosystem processes exhibit effects of differing importance at different spatial and temporal scales and these processes interact across scales. The concern for issues of global climate change in regard to streams has provided additional motivation to analyze entire basins or all the basins in continental regions. Thus, a challenge for lotic ecologists in the twenty-first century remains the integration of data-rich studies at the reach level to entire watersheds and finally the coarse resolution of regional basin analysis relying on satellite imagery. 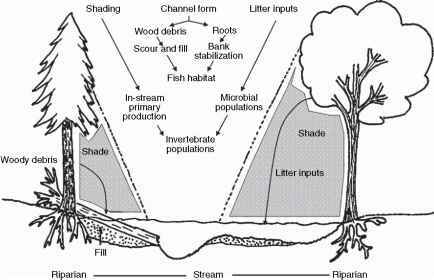 The 'river continuum concept' and other stream/ river conceptual models described below should continue to aid in the integration of knowledge about lotic ecosystems along whole catchments, from micro-to macroscale levels.